Alex Knight started DJing at the age of 13 when he got his first pair of turntables. Not long after that, he started digging through the crates at local record shops, as well as creating his own music. 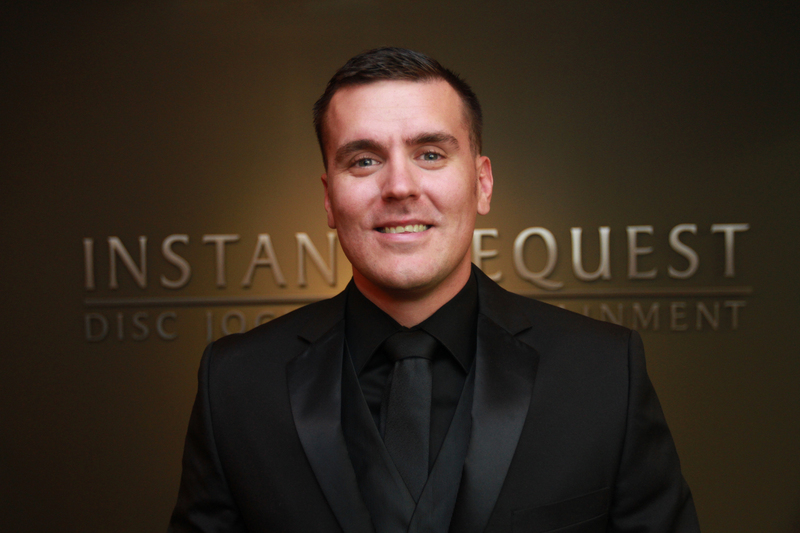 He has now entertained at hundreds of events, making him one of Instant Request’s most sought after Black Tie DJs. With that being said, Alex is known for his ability to please any type of crowd with his knowledge and skills in mixing any genre of music as a DJ and confidence as an MC. He prides himself on making brides and grooms feel at ease with his professional, laid back style and dedication to making their big day memorable. DJ Alex Knight was FANTASTIC! First of all – when he gave us the option of meeting either at a coffee shop or a brewery we knew we’d be friends. We hit it off right away, and talked through our online planner which was really nice to do leading up to the wedding day. We felt like Instant Request did a really great job of pairing us with a DJ who could read our vision, and jive to our taste, while also reading the crowd and what would help to get them out on the dance floor. We were bustin’ moves all night long, and Alex was great about encouraging us to come out and join everyone after we took little breaks to refill our cocktails or visit with guests we hadn’t yet had the opportunity to chat with (“could we get the bride and the groom out here for this one? !” etc.). We had a great experience, and would definitely recommend Instant Request DJ (especially DJ Alex Knight) to family, friends, and couples looking for a great reception singing and dancing with their loved ones. We had a great experience with Instant Request at our wedding. Alex Knight was our DJ and really did an incredible job going above and beyond. Your wedding night goes so quick and Alex was so great at keeping things organized, making sure we were on time, and checking in with us throughout the evening. He really knows what he’s doing, making it so easy to trust him completely 🙂 he did a fabulous job keeping our crowd dancing and having a good time all night! Our ceremony sound and music was great as well, everything went flawlessly. We received so many compliments from our guests (of all ages!) about him and would totally recommend him over and over! Thank you again to Alex and instant request- we appreciate you! Alex was a killer DJ and took the time to understand the type of music we wanted and event and night we were looking for. He fit what we wanted and our crowd perfectly and the dance floor was constantly packed and with our age groups he was able to get everyone having a killer night. Can’t recommend Instant DJ and Alex enough. All of our interactions with Instant Request were pleasant in planning for our wedding, and the actual reception went so well, all for a very reasonable price! The office always replied promptly to our enquiries via email, the event planner was very easy to use, the phone consultation was extremely useful and calming as we knew things were in good hands. Alex, our DJ, did a great job emceeing and accommodating every last change and request. He was a great balance of fun and professional. Definitely glad we went with them, especially for the money, and would recommend them to anyone! We can not stop saying the most amazing things about Alex Knight from Instant Request DJ Entertainment. Not only was he super easy to communicate with, he did an absolute flawless job at keeping all ages of guests up and dancing until the final song. He respected the style of music we liked, played all the songs we requested that weren’t even on the Instant Request list, and then he supplemented those with his own picks that were insane crowd pleasers without being cheesy. We had our ceremony, cocktail hour, dinner, and dancing all in separate rooms at The Minneapolis Club, and he navigated the music around perfectly (which is not an easy thing to do). During our ceremony, he knew exactly when to start phasing in a song so there were no awkward silences, and he modified the father/daughter and mother/son songs so they weren’t incredibly long. Our guests are still talking about how awesome Alex Knight was and we will continue to recommend him to everyone we know. Best Dj ever! Played great music and kept the party going all night long!